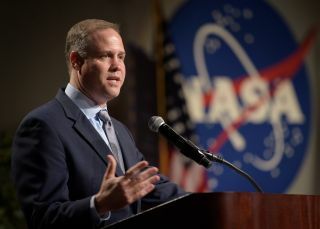 NASA Administrator Jim Bridenstine delivers remarks at the Johnson Space Center in Houston on Aug. 2, 2018. "In fact," the NASA administrator said, "we want lots of humans in space." "When you look back at history, look back at the end of the Apollo program, 1972 when we didn't go back to the moon... you look back and there was a period of time there after Apollo and before the space shuttles when we had a gap of human spaceflight capability," Bridenstine said. "And then you go forward and look at the retirement of the space shuttles in 2011, and now we're getting to the point where we're ready to fly commercial crew. We've got a gap of about eight years in our ability to fly crew into space. "When we think about the [end of the] International Space Station, we want to make sure that a gap doesn't materialize," he said. "I believe it is important to do everything in our power to prevent another gap from occurring and that is why it is important to start this conversation now." "If you go back to 2009, the United States, through NASA, made a critical discovery, which is the moon has hundreds of billions of tons of water ice. To me, that should have changed our direction immediately," he said. "From 1969, when we first landed on the moon, up until 2009, a lot of people believed that the moon was bone-dry. In 2008, the Indians did an experiment and they realized there was water ice on the moon and then we did an experiment and realized how much water ice could potentially be on the moon at the poles. "So the question is — during those 40 years, we missed that. What else have we missed?" Now, as NASA administrator, Bridenstine is carrying out President Donald Trump's direction of returning astronauts to the moon. "We need to get to more parts of the moon than we have ever gotten to ever before," he said. "When you look at the Apollo program, we had six landings, all in the equatorial regions of the moon, and we didn't get the full perspective, the full understanding, the science and the knowledge." "I think a lot of people miss the fact that the moon represents an amazing proving ground for all of the technologies and the human-performance capabilities that are necessary to survive on another planet and the ability to develop in-situ utilization abilities," Bridenstine said. "The moon represents the capabilities to do that activity for the first time, rather than doing it on Mars for the first time, where you can't come home for another two years." Jim Bridenstine, seated left, facing camera, and NASA Johnson Space Center Director Mark Geyer, seated right, facing camera, participate in a media roundtable that was held in front of the Orion test crew capsule for the Ascent Abort-2 (AA-2) test, on Aug. 2, 2018, at NASA's Johnson Space Center in Houston. Bridenstine said the key to opening up the moon — and going to Mars — is building "Gateways" — small, space-station-like platforms that serve as lunar orbit outposts or transports for points outward. "The [first] Gateway is going to be in a near-rectilinear halo orbit. It is not optimum for getting to the surface of the moon, but it enables with a very low propulsion capability — we're talking about solar electric propulsion — it enables us to stay in that orbit for a very, very long period of time," Bridenstine said. "And it enables us, the United States of America, to invest in critical infrastructure from whence our commercial partners can go back and forth from Earth to lunar orbit, from which our commercial partners can build their own landers to get to the surface of the moon. "What we want to do is enable more people to have access to the lunar surface than ever before and more people to have access to lunar orbit than ever before," he said. "The interfaces we have on Gateway, whether it is power or docking, it is all going to be published on the internet. We want to enable everybody — including countries that historically do not have big space budgets — to look on the internet and say, 'Look, we could build something that could actually be effective at the Gateway.'" Bridenstine made it clear that the Gateway won't be another International Space Station. It won't be permanently crewed, but it could support humans for 30- to 60-day science missions. A second Gateway, though, might be what carries astronauts to Mars, perhaps by around 2030, he said. "The first Gateway is about the moon, but I think the second Gateway, being a deep-space transport, again using commercial and international partners, enables us to get to Mars," Bridenstine said. "What we don't want to do is go to the surface of the moon, prove that we can do it again, and then be done. "We want to go to stay. And the Gateway, in my view — I've been convinced — enables us to take advantage of commercial and international partners in a more robust way so we are there to stay, it enables us to get to more parts of the moon than ever before, and it enables us to get to Mars," he said. "There is no other architecture that I have been presented with, given the current budgets that we have, that enable all of that." Robert Pearlman is a Space.com contributing writer and the editor of collectSPACE.com, a Space.com partner site and the leading space history news publication. Follow collectSPACE on Facebook and on Twitter at @collectSPACE. Follow us @Spacedotcom, Facebook and Google+. Original article on Space.com.